There is no feeling in the world like bringing a new baby home. As you come home full of relief and excitement for what is to come, it's a time for you to enjoy the new little bundle of joy in your life. But the long hours of pacing, rocking and feeding can quickly steal your joy. Your sweet newborn seems to immediately awaken as your exhausted head hits the pillow and that joy begins to turn into desperation. Getting a newborn to sleep in a bassinet can be a challenge. Here are some techniques to try. Gently rocking and swaying helps soothes. Your baby may enjoy swaying, movement or bouncing about. The motion itself is calming to most. Using a rocking in a chair or glider before bed can also console baby long enough to get them into a deep sleep. Many rocking bassinets are also available, even some that gently and quietly rock on their own, allowing you to catch Z's while the bassinet does the work. For many babies, white noise is a comfort since it mimics the sounds he/she was accustomed to hearing in the womb. When the consoling sounds of mom's heartbeat and muffled voice become the still silence of a quiet nursery, it can prove to be a harsh adjustment for a newborn. The whir of a small fan or simply mom’s shushing can a lull a fussy baby to sleep. It also creates a monotonous background of sound that helps to drown out any other ambient noises that may startle baby awake. A white noise machine gives you the advantage of an all-night hands-free approach to getting baby to stay asleep while you get much needed rest right next to him. The safest position for a newborn is on their back which can also prove to be the least comfortable for some babies. Since they assume the fetal position in the womb for forty weeks, they naturally want to return to a similar position outside of the womb. Swaddling them keeps those little arms and legs from flailing about, tucked warmly into a blanket while they safely sleep on their back. If your baby tends to be warm by nature and isn't happy in a swaddle, try a lightweight muslin baby blanket. Is My Baby Hot Or Cold? We bundle our newborns for many reasons. One major reason is because they lose their heat so quickly. It is hard for them to maintain a comfortable body temperature. While some need constant bundling and snuggling, some babies may be naturally warm from the get-go. Pay special attention to their temperature needs and swaddle accordingly. Swaddling your baby with his feet out can keep him comfortable without overheating if necessary. Often we can forget that these little creatures we have birthed have their own ideas of what is comfortable. Keep your bassinet simple. Dress your baby in something warm that does not require a blanket or swaddle them. 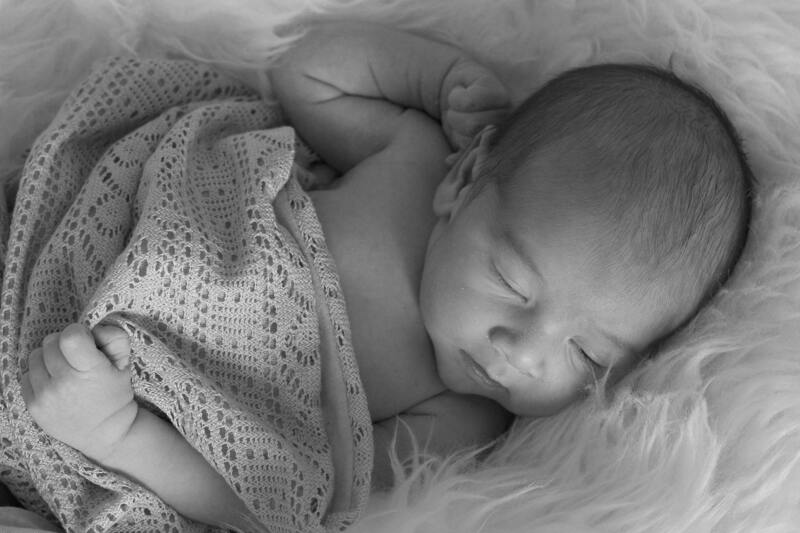 Loose blankets could be dangerous to a newborn and may also lend too much heat which may add to a fussy baby. A clean diaper can go a long way for baby too. Even if he is not ready for bathing yet, making habits to prepare for bedtime routine is a good idea. Get him ready for bed with a fresh diaper, a bottle and some snuggles before placing him in the bassinet for the night. This sleep routine may have bought yourself some extra time before his first wake. Dream feeding can aid in calming them to sleep as well. By nuzzling your baby and feeding him in a dimly lit room, your are more likely to have a calm and comfortable baby that drifts off to sleep without too much trouble. Is My Baby's Sleep Environment Appropriate? Remember that a dark room is important for building good sleep habits for everyone, including newborns. Blackout curtains are a great option to bring complete darkness to a room so you can control the amount of light coming into it. Sleeping in a room with a television on can disturb a newborn, even the light from a phone or device can be an interference. Sleeping in darkness from a young age will be beneficial for your child as they grow as well and may help them sleep longer as they get older. Babies naturally follow a pattern of eating, being awake and active, going to sleep and starting over again. A pattern will develop and you should try to regulate to create longer nights. Follow baby's awake period with a bedtime routine and a dream feed and allow their sleep cycle to occur naturally. Adjusting your timing to coincide with theirs can make a world of difference. Natural oils like lavender and roman chamomile have properties that calm and relax and can help create a peaceful sleep setting. While it's important to exercise caution when applying essential oils directly on baby. Try using oils sparingly in their environment can have a calming effect for both baby and you. Blend the essential oil with a carrier oil and apply to your own chest so baby can breathe it in as you rock them to sleep or simply diffuse a small amount of the oil in the room the bassinet is in. Staying in tune with your baby's needs can come naturally at times or it may leave you feeling exhausted and at a loss for what will work. Trying new things, being flexible and finding effective methods for you and your child is a working progress. The first few weeks and months of life with a newborn are one big learning experience. It helps build that special bond between you and your baby. Whether rocking, swaddling, dream-feeding or a combination everything, you will start to understand what your newborn needs and create a healthy sleep habit in a bassinet. Eventually you'll find a happy rhythm with your newborn as your parenting adventure continues!